Measles is the most deadly of all childhood rash/fever illnesses. The disease spreads very easily, so it is important to protect against infection. To prevent measles, children (and some adults) should be vaccinated with the measles, mumps and rubella (MMR) vaccine. Two doses of this vaccine are needed for complete protection. Children should be given the first dose of MMR vaccine at 12 to 15 months of age. The second dose can be given four (4) weeks later, but is usually given before the start of kindergarten at 4 to 6 years of age. Measles starts with a fever. Soon after, it causes a cough, runny nose and red eyes. Then a rash of tiny, red spots breaks out. It starts at the head and spreads to the rest of the body. Measles can lead to pneumonia, encephalitis (swelling of the brain), and death. Measles spreads through the air when an infected person coughs or sneezes. It is so contagious that if one person has it, 90% of the people around him or her will also become infected if they are not protected. People in the U.S. still get measles, but it’s not very common because most people in this country are protected against measles through vaccination. However, measles is still common in other parts of the world, including many countries in Europe, Asia, the Pacific and Africa. Every year, unvaccinated people get measles while they are abroad and bring the disease into the U.S. and spread it to others. Measles can spread quickly in communities where people are not vaccinated. Children and anyone else who is not protected against measles is at risk of getting infected. That’s why it is so important to be up to date on vaccinations, including before traveling abroad. the second dose before entering school at 4 through 6 years of age. Your child’s doctor may offer the MMRV vaccine, which protects against measles, mumps, rubella and varicella (chickenpox). MMRV vaccine is licensed for children 12 months through 12 years of age. It may be used in place of MMR vaccine if a child needs to have varicella vaccine in addition to measles, mumps and rubella vaccines. Your child’s doctor can help you decide which vaccine to use. Children six (6) months of age and older should be protected against measles before they travel abroad. Infants six (6) months through 11 months of age should have one dose of measles vaccine. Infants who get one dose of measles vaccine before their first birthday should get two more doses of the vaccine (one dose at 12 through 15 months of age and another dose at least 28 days later). Children 12 months of age or older should have two doses separated by at least 28 days. Talk with your child’s doctor to see if he or she should be vaccinated before traveling abroad. Some teens and adults need measles vaccine too. For more information, see Measles Vaccination: Who Needs It? Most health insurance plans cover the cost of vaccines. But you may want to check with your health insurance provider before going to the doctor. Learn how to pay for vaccines. If you don’t have insurance or if your insurance does not cover vaccines for your child, the Vaccines for Children Program may be able to help. This program helps families of eligible children who might not otherwise have access to vaccines. To find out if your child is eligible, visit the VFC website or ask your child’s doctor. You can also contact your state VFC coordinator. Measles is a highly contagious disease. It can be serious for young children. Protect your child by making sure he or she is up to date on vaccinations, including before traveling abroad. Measles is a very contagious disease caused by a virus. Measles starts with a fever. Soon after, it causes a cough, runny nose, and red eyes. Then a rash of tiny, red spots breaks out. It starts at the head and spreads to the rest of the body. Measles can be serious for young children. It can lead to pneumonia, encephalitis (swelling of the brain), and death. Measles spreads through the air when an infected person coughs or sneezes. It is so contagious that if one person has it, 90% of the people around him or her will also become infected if they are not protected. People in the United States still get measles, but it’s not very common. That’s because most people in this country are protected against measles through vaccination. However, measles is still common in other parts of the world, including many countries in Europe, Asia, the Pacific and Africa. Every year, unvaccinated people get measles while they are abroad and bring the disease into the United States and spread it to others. From January 1 to April 24, 2015, 166 people in the United States have been reported as having measles. Most of these cases are part of a multi-state outbreak linked to an amusement park in California. Your child’s doctor may offer the MMRV vaccine, which protects against measles, mumps, rubella, and varicella (chickenpox). MMRV vaccine is licensed for children 12 months through 12 years of age. It may be used in place of MMR vaccine if a child needs to have varicella vaccine in addition to measles, mumps, and rubella vaccines. Your child’s doctor can help you decide which vaccine to use. 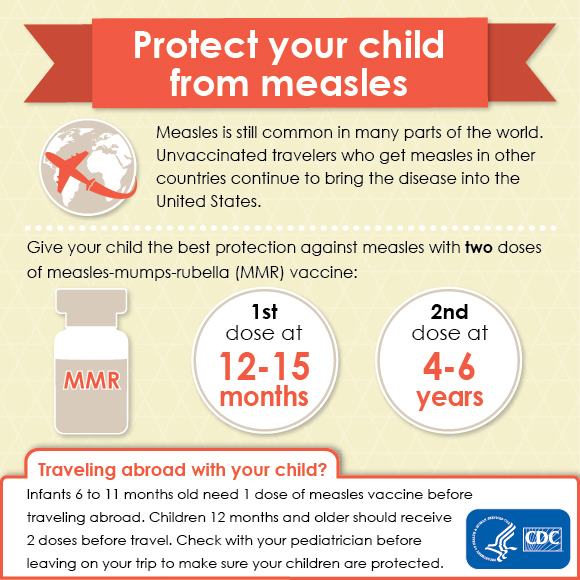 People 6 months of age and older should be protected against measles before they travel abroad. Infants 6 months through 11 months of age should have one dose of measles vaccine. Infants who get one dose of measles vaccine before their first birthday should get two more doses of the vaccine (one dose at 12 through 15 months of age and another dose at least 28 days later). Visit the immunization scheduler for newborn to 6-year-old children.